Nikki's into HAIR, Chris, HAIR, make-up, HAIR, jewelry, nails, friends, SpongeBob, Tigers, tattoos, music, HAIR, body piercing, HAIR, more friends, clothes, talking on the telephone and Oh did I say HAIR?. Nikki's my "high maintenance" Material NOW Girl! She loves to draw and is quite the little artist. I only wish she'd show a little more enthusiasm towards keeping her room clean and answering me when I call... What's that called ~ Selective hearing? Ebay, Milk, Demolition Derby's, Chocolate Milk, Macaroni and Cheese, fixing all the stuff we break, Science homework and making us laugh. Chuck taught me the meaning of procrastination. *g* Before I met him EVERYTHING had to be done NOW!! While things still get done around here now I take time to smell the flowers and enjoy the little things life has to offer. And then there's Peanut! 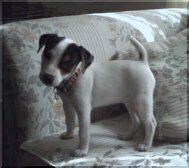 Our appropriately named Jack Russell dog who won't be neglected if she has anything to say about it. We picked the name Peanut because she was so teeny when we brought her home and she has this overbite that makes her look kind of nutty. Peanut is such a goofy dog! Some of the stuff she does is so funny. She plays like a cat, often with 2 and 3 things at once. When I'm on the phone she's like a kid trying her best to make her presence known. Look out when she's tired, then all she wants to do is bundle herself in her blanket and goes to great lengths to do so. But her favorite spot is bundled up with me in my blanket at my desk. I don't like my keyboard on that slider thing so I put a pillow there for her and she fits there just right. :o) Of course Peanut has her own section so be sure to stop by before you leave. We had to say goodbye to Speedy on 11/30/01. She had cancer and died in my arms. Words cannot describe how much this wonderful creature meant to me. What a comfort she was. Speedy knew when you were sad and she'd even lick the tears from your eyes if you'd let her. You'll be able to read lots more about Speedy in the pages that follow. And Me a product of both the 60's and 70's... I used to work for a major pharmaceutical company as a Customer Service Rep. Wooo Hooo...Now I'm my OWN boss doing what I love, making original country style graphics! You can check me out any old time at my Blog or HoneyBrook Graphics. If you lived as a child in the 50's, 60s or the 70s as I did, it's hard to believe that we have lived as long as we have.... As children, we would ride in cars with no seat belts or air bags. Riding in the back of a pickup truck on a warm day was always a special treat. We would leave home in the morning and play all day, as long as we were back when the streetlights came on. No one was able to reach us all day. No cell phones. Unthinkable. We played dodge ball and sometimes the ball would really hurt. We got cut and broke bones and broke teeth and there were no lawsuits from these accidents. They were accidents. No one was to blame but us. Remember accidents? We had fights and punched each other and got black and blue and learned to get over it. We ate cupcakes, bread and butter, and drank sugar soda but we were never overweight... we were always outside playing. We shared one grape soda with four friends, from one bottle and no one died from this? We did not have Play stations, Nintendo 64, X Boxes, 99 channels on cable, video tape movies, surround sound, cellular phones, personal computers, Internet chat rooms, ...we had friends. We went outside and found them. We rode bikes or walked to a friend's home, knocked on the door, rung the bell or just walked in and talked to them. Imagine such a thing. Without asking a parent! By ourselves! Out there in the cold cruel world! Without a guardian. How did we do it? Little League had tryouts and not everyone made the team. Those who didn't had to learn to deal with disappointment... Some students weren't as smart as others so they failed a grade and were held back to repeat the same grade. Tests were not adjusted for any reason. Our actions were our own. Consequences were expected. No one to hide behind. The idea of a parent bailing us out if we broke a law was unheard of. They actually sided with the law, imagine that! This generation produced some of the best risk-takers, problem solvers and inventors, ever. The past 50 years has seen an explosion of innovation and new ideas. We had freedom, failure, success and responsibility. I collect 1/16th scale cars. At last count we have 143 NASCAR miniature cars and my favorite racecar driver is Terry Labonte in the #5 Kellogg's Corn Flakes car with Ricky Rudd and Bill Elliott running neck and neck for my next favorites. And in my family room alone I have 14 clocks. Late at night when everyone is asleep I like to just listen to all of them ticking at once. Sometimes I try to put the ticking to a tune. But the only tune I can come up with is the song "Time Has Come Today" by The Chambers Brothers. Well that's it for now. If you wanna read how me and Chuck met you can go . HERE And if you want to read about our wedding go HERE.